It is not often I review books, but then it is not often I read a novel about a rescue dog. 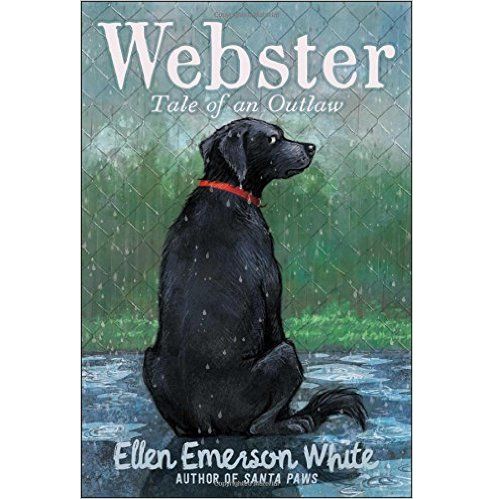 The book opens with Webster, a Lab mix, being left at a rescue by his adoptive family. That is a good thing, even if Webster can’t accept it. He has landed in a tub of butter. As soon as he figures out he is in a shelter, he decides to break out, despite the fleecy dog bed, homemade biscuits, and kind attention from the rescuers. One of the fun things about this book is the story is told from Webster’s perspective. The rescuers, as in real life, are in the background working away for him and he rarely notices them, or if he does, he can’t figure them out. Webster, unused to kindness, is suspicious of everyone. The other dogs hold lively conversations with him (this is a novel) telling him adoption is good and he needs to stay at the rescue. Webster is having none of it, a self-styled “bad hat,” he wants to be “the dog who walks by himself.” He leaves his safe haven to find adventures and the life of a loner. But life on the run has a set of problems too. How can you get dinner if you don’t have a bowl? This is a humorous look at life from the perspective of a dog who has given up on people, but that is as dark as the story gets. No animals die in this book and although Webster had a family who mistreated him, he lands in the good hands of many who care. “The Bad Hat wasn’t about to interact with any more people, but he loved to play with balls. Webster is very entertaining and not predictable. I am not giving away anything to say he becomes an Internet darling. In fact, he has his own FaceBook page which shows some of the real animals who inspired the writer. 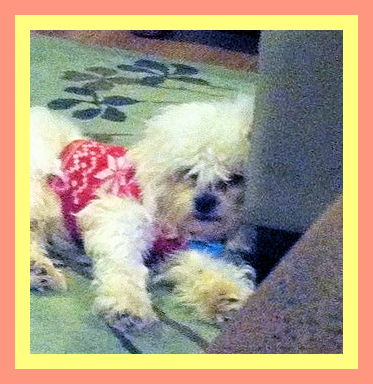 Teddy is a Shih Tzu/Bichon Frise mix. He is just as cute as can be. Teddy got out on Oct. 28th and became lost. Teddy would be home today except the woman who found him, let’s call her Jane Doe (although Cruella de Vil would also fit), wanted to keep Teddy. The woman who found him failed Teddy and veterinary practice also failed him. 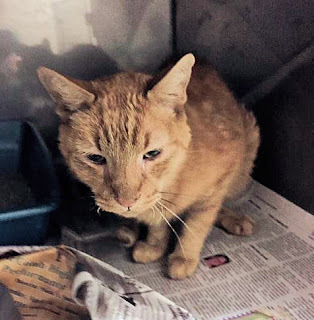 Correction: A previous version of this article stated Teddy was taken to Haltom City Shelter for scanning. This information was provided by PetWatch. However, a staff member at Haltom City Animal Hospital says Teddy was scanned there and not at the city shelter. Next stop for Jane Doe, and unhappily for Teddy, was her veterinary clinic. She sent a friend with Teddy to the clinic. Clinic staff also scanned for the chip. A staff member called the chip company and was told Teddy had an owner. What was the response by the vet staff? Did they contact the owner? No, vet staff called and tried to get the chip company to change Teddy’s ownership information to the woman who walked in with Teddy. At this point the chip company realized Teddy was being stolen. The company called Teddy’s owner, Vanessa Ferrino, and told her someone had found her dog and was trying to keep him. The chip company gave her the name of the veterinary practice, but not Jane Doe's information. Ferrino called the vet and they would not disclose any information. Ferrino was able to find out Jane Doe’s contact information by filing a police report. Even though Jane Doe’s address is known, Teddy is still missing. Why? Teddy supposedly ran away from Doe’s friend. How convenient. If Doe had Ferrino’s Rolex watch, would she escape charges because she found and gave the watch to a friend? What about Doe's friend who took and then lost the watch? Per the police, no crime was committed. They did not visit any of the people seen with Teddy. Many animal rescuers are familiar with Camp Katrina, also known as Tylertown, in the small town of Tylertown, Mississippi. The Humane Society of Louisiana (HSL) ran their operation from a building there which burned to the ground on October 26. They had remained there after Katrina to run a shelter. A ferret and at least two cats died. Some cats are missing, but presumed to have survived. The staff is attempting to recover these cats as the commotion subsides. There were two staff members living in the building. They lost their home and all their possessions. Over a dozen cats are being treated for smoke inhalation and will have a long recovery. HSL is in need of donations to cover veterinary care. They also need donations to replace what has been lost. Here is their wish list. They had a long term plan to move to a newly purchased property and now the fire has sped up that timeline and donations are needed for that endeavor as well. On this anniversary of Katrina, many of us are certain that if nothing else came out of the flooding of New Orleans, evacuees will never again be forced to leave without their animals. Now it turns out this is not true. Last weekend, as animal rescuers gathered in New Orleans to commemorate the tenth anniversary of Katrina, the people of the Blackfeet Reservation in Heart Butte, Montana were forced to leave their animals behind when fleeing a wildfire. They were under a mandatory evacuation because their small town was threatened by the Spotted Eagle Fire. How could this be possible after passage of the Pets Evacuation and Transportation Standards Act of 2006, the federal law commonly called the Pets Act? The Blackfeet reservation is a law unto itself, so those in charge have the authority to prevent people from evacuating with animals. If you have no car, and you have children, you have no choice but to get on the evacuation bus provided and take your children out of danger, no matter how much it breaks your heart to leave your dog or cat behind in danger. However, the Blackfeet people are not without their resources, and one of their own made the three hour drive from Helena, Montana to help the animals left behind. 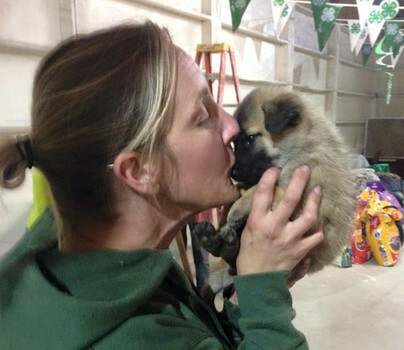 Gina Wiest is the Director of Helana, Montana’s “Lewis and Clark Humane Society.” She is a Blackfeet and she has family near Heart Butte, the reservation town under evacuation order. Wiest collected supplies, drove to the area, checked in with local animal rescuers and learned that no evacuating residents were allowed to take their animals and no animals were permitted in the Red Cross shelter. Of course those with vehicles could take animals, but many were dependent on reservation busses for transportation to safety. Wiest did not hesitate. 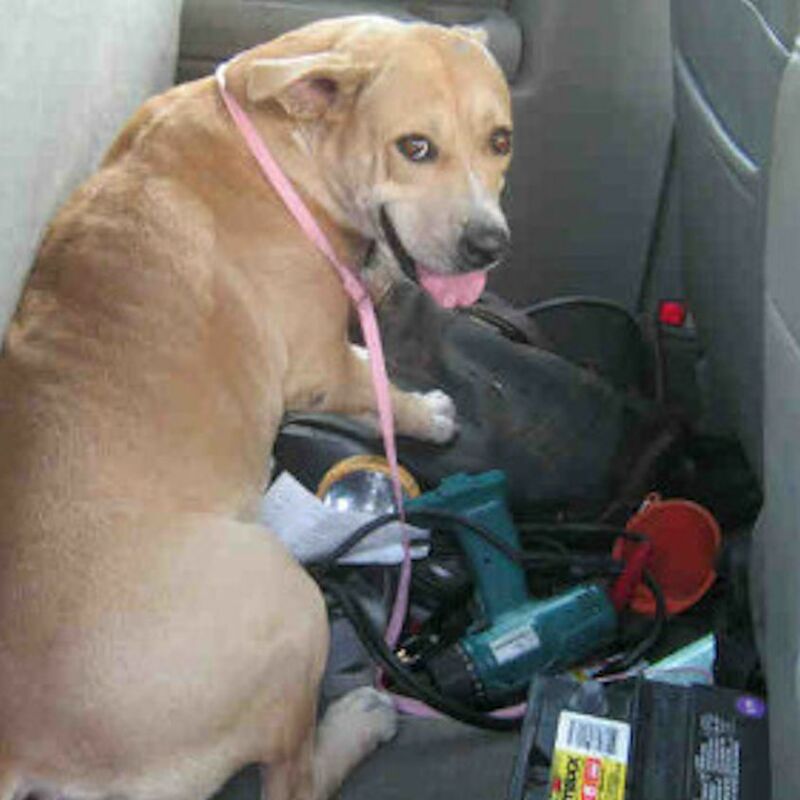 She called state level authorities of the Humane Society of the United States (HSUS) and asked for help. (She also authorized a GoFundMe.) HSUS immediately approved funds and people to start setting up an animal shelter that day at the 4-H fairgrounds. Animeals in Missoula sent 1,000 pounds of food and is now out after helping out with other wildfires. The Pad For Paws Foundation also donated $1,000 worth of cat and dog food. It was a statewide effort to help. Gina Wiest partnered with Kim Wippert of the reservation’s Pets For Life program and with Denise Salois of the Kaawa'pomaaka Rescue Society of Browning. They got her access to the Red Cross shelter and the fire zone and accompanied her. As a result of their efforts, the trio was granted access to the fire zone to collect animals. At the Red Cross shelter, they found people sheltering in their cars with their dogs and cats because the Red Cross would not allow animals inside the shelter. All those people welcomed the news that an animal shelter would be provided. When evacuees arrived at the Red Cross shelter, some found people with cars who offered a ride back to pick up the animals they left behind. Those evacuees, who wanted to retrieve their pets, were told if they left to get animals, they would not be permitted back into the Red Cross shelter. However, the animal rescuers were given access to talk to the evacuees. When an announcement was made that animal rescuers would be picking up animals, people came forward with their house keys and instructions. It was late afternoon, the rescuers and a few other volunteers took two trucks and fifteen sets of house keys and left for the wildfire area. Wiest says she felt safe. They checked in at the fire hall. The fire officials knew she was permitted to rescue animals and they knew where she would be with her team. Wippert had a walkie talkie and as they went from house to house, emergency responders were driving up and down telling people to leave. Some people were refusing to leave their animals and those holdouts were threatened with fines if they stayed. It was a desperate situation. For every animal she had permission to pick up and room to take, there were many more animals who were roaming. Wiest was disheartened at not being able to take them all. She thought the street dogs, whom she fondly terms “rez dogs” had the resources to flee and she did not have the resources to gather them up. But they did rescue a dog trapped and howling in an open dumpster. The dog may have gotten stuck looking for food, but perhaps someone put her in the dumpster. They were able to go back in much later that night and once again the next day. They ultimately rescued eighty animals left behind, including two rats, a vole, a rabbit, and the dog in the dumpster, now named Dumpsy. The fire did not reach the town and, as of this writing, the evacuation order for most, but not all, of Heart Butte is lifted. No homes were destroyed and all the street dogs are safe. Most people are back in their homes, but the emergency animal shelter will remain active until at least the weekend, as some people are still under the mandatory evacuation order. But the sad reminder of Katrina still lingers. If there has to be another evacuation, people will not be allowed to take animals on the evacuation busses. Had the fire reached the town, people and animals would have perished due to these restrictions. Here is an online fund raiser to help with the expense of the animal evacuation and to help the animals on the reservation. Every cent donated to the “Lewis & Clark Humane Society GoFundMewill go to helping reservation animals.” Kim Wippert is running a pet retention program, Pets for Life, to help people on the reservation with limited means keep their animals. She is now implementing a pet food bank and extra donations will help get that started. Gina Wiest has great respect for the “rez dogs.” One evacuated Malmute named Ghost is a veritable Houdini. Each morning, no matter their efforts to secure him, he meets the volunteers opening up at the door to the animal evacuation building. Ghost spends the day hanging out with staff and helping himself to treats in closed containers. After all, if you can get out, you can get in! But even a Houdini dog like Ghost would have a hard time locked in a house with a wildfire approaching. Sometimes a disaster, such as the current wildfires, allows people time to evacuate and reserve at a motel. Finding accommodations can be a problem if you have animals. Here is a quick guide to where your whole family is welcome. Be aware that motels with a “no animal” restriction may suspend that during a local emergency. Fees at pet friendly motels may also be suspended if you ask. La Quinta. During an emergency, this is the chain that will fill up first because they are widely known for accepting animals without charging extra. Call 1-800-753-3757 and let the Reservation Sales Agent or front desk Sales Representative know that you are traveling with a pet. Motel 6 allows animals with a $10.00 charge per day, capped at $50. Call 1-800-899-9841. Best Western allows animals with some restrictions. Fees vary, and there may be no fee, but are capped at $20 per day and $100 per week. Again, any of this could change to accommodate evacuees and negotiation may be possible. Call 1-800-780-7234. Super 8 will probably accept your dog or cat, but may charge a fee. It depends on the individual motel policy. Call 1-800-454-3213. Choice Hotels include the well known motels: Comfort chain, Quality, Clarion and several others. Their website says many of their locations will allow animals. However, the fees and deposits may be prohibitive. You will just need to inquire at the individual motel. Reserve at 877-424-6423 for any of the motels in this chain. Of course there are many independent motels that also accept people with animals. There are even motels that accommodate horses! The key is to book early before the pet friendly inexpensive motels are completely booked. 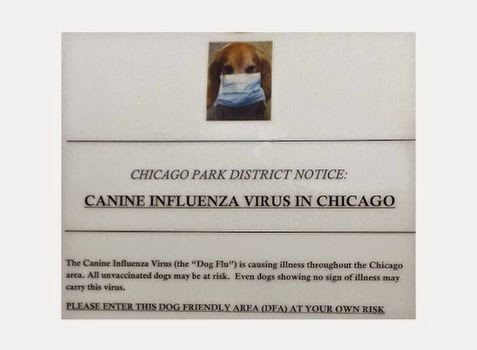 Chicago in crisis: Where will dog flu spread? Bark in the Park Chicago attracts thousands of dogs every May. But, it will not take place this year. Bark in the Park is cancelled because the canine influenza epidemic shows no sign of abating. Some dog training establishments in municipal Chicago have suspended their classes, waiting for dogs to be fully vaccinated, per Stacey Hawk of Hawk City K-9. She speaks for many when she says, "It's hitting all of us hard, financially and emotionally, for all of the dogs we know going through this." Right now the flu is primarily affecting Chicago, but there are signs it could spread and when it does, veterinarians and pet owners may not be prepared. Symptoms are fever, cough, nasal discharge and lack of energy. Per Hawk, “What people don't realize is how contagious this is, and because it's airborne, dogs don't have to be in the proximity of other dogs to get this. It can last on hard surfaces for up to 48 hours and on soft surfaces (clothes, shoes) 24 hours. Healthy, young dogs who are not social, who don't do group activities, and who don't go to dog parks or daycare have gotten this. Dogs have caught the flu in their building's elevator." Cases of the flu have now been reported in CA, MI, WI, IN and MO. Vets in the Chicago suburbs are reporting an uptick in cases. Vets in South Bend are calling their clients to suggest vaccination, even though no cases have been reported there. A dog in Madison, WI recently visited Chicago and now has the flu. So many dog owners in Madison have asked for the vaccine, that it is in short supply. This is not a vaccine which is ordinarily stocked. This writer called her vet in San Antonio and was told the vaccine would have to be ordered if requested. A Chicago man became a folk hero recently when he was filmed driving his Jeep off a tow truck hook while the back bumper was being lifted in the air. It now turns out he had no choice. His Bulldog was in the car. Jaime saw the Lincoln tow truck driver circling his Jeep and he ran back and jumped in the driver's seat and said he was moving the car. This did not deter the tow truck driver. Jaime yelled at the tow truck driver to stop, but his Jeep was lifted in the air. Jaime opened the window, and yelled, "Hey buddy, watch this!" That is when he drove right off the tow hook and into Chicago history, slamming the back of his new Jeep on to the pavement. Jaime was adamant that he was not going to allow his vehicle to be towed. "He thinks he’s gonna take my car with my bulldog in it? Hell no!" Lincoln Towing had no comment, but Jaime had one thing wrong. He called the tow company "sharks." Everyone in Chicago should know the tow truck drivers are "pirates." Enjoy listening to the late great Steve Goodman sing his classic, "Lincoln Park Pirates." Follow these stories and writing by other Texas writers on "Texas Animal Writers" on FaceBook. I am a Hoosier who spent many years in Chicago and am now in San Antonio. My passion is reuniting lost dogs with their families. I am the Director of the Facebook page, Lost Dogs of Texas and a co-founder of "Lost Dog Awareness Day." I am not new to reuniting families. After Katrina, I helped people in evacuee shelters in San Antonio to track their missing family members. After that work ended, I started a volunteer group that reunited over 1500 Katrina animals with their families by deciphering information online and tracing evacuees. I am writing a book about two stolen Yorkies who were found after an amazing eighteeen month search. It is tentatively titled "Finding Baxter and Cooper: A Woman, a Private Investigator and their Successful Search for Two Stolen Dogs."